Opened in 2000, the Documentation Center at Prora is a center dedicated to preserve Prora as a historical monument and to develop and utilize it in an appropriate manner as it relates to its historical importance. The foundation “Neue Kultur” opened the center to close a gap in Germany’s memorial landscape. 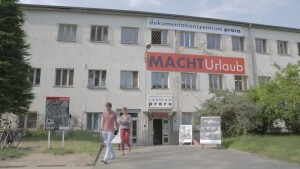 The center currently hosts the permanent exhibition MACHTUrlaub, an exhibition about the construction history Prora, and its political background.